Today I talked to an Israeli friend about the state of the Israeli economy and particularly about the importance of monetary policy. One can really characterise the Israeli economy as being ‘boring’ in the sense that growth, inflation and markets have been quite stable in recent years – despite of the “normal” political (and geopolitical) uncertainty in Israel. My friend told me a very interesting anecdote, which in my view quite well explains why things have been so ‘boring’ in Israel in recent years. He told me that in 2007 as the first financial jitters had hit the global economy Bank of Israel (BoI) governor Stanley Fischer had explained what was going to happen. According to my friend Stan Fischer said two things. First, Fischer had warned that what was underway in the global financial markets and the global economy would become very bad. In that sense Fischer rightly ‘predicted’ the crisis. Second, and more importantly in my view Fischer had demonstrated just how well he understand monetary theory and policy. Hence, my friend had asked how it would be possible to offset an external (demand) shock to the Israel if interest rates would drop to zero. Fischer had explained that there would be no problem at the Zero Lower Bound. The BoI would always be able to ease monetary policy – even if interest rates were stuck at zero. And Fischer then went on to explain how you could do quantitative easing and/or intervene in the currency market. It should of course be noted that this account is second-hand and my friend might have not gotten everything exactly right from something Fischer said five years ago. However, subsequent events actual tend to show that Fischer was not only well-prepared for the crisis, but also knew exactly what to do when crisis hit. This can hardly be said for European and US central bankers who in general completely failed to do the right thing in 2008. And note here that I am not praising anybody for acting in a discretionary fashion. What I am praising Fischer for is that he fully well understood that the “liquidity trap” only is a mental constraint in the heads of central bankers (Just listen here to Fischer explaining this on Bloomberg TV back in 2010 when the Fed had announced QE2 – he is also bashing those central bankers who complain about ‘currency war’). And Fischer did exactly what he had said could be done if necessary when it in fact became necessary in 2009 to ensure nominal stability. Hence, in February 2009 the BoI started to conducted quantitative easing. The graph below illustrates Fischer’s remarkable success. That is a straight line if you ever saw one! And there was no dip in NGDP in 2008 or 2009. Just straight on. 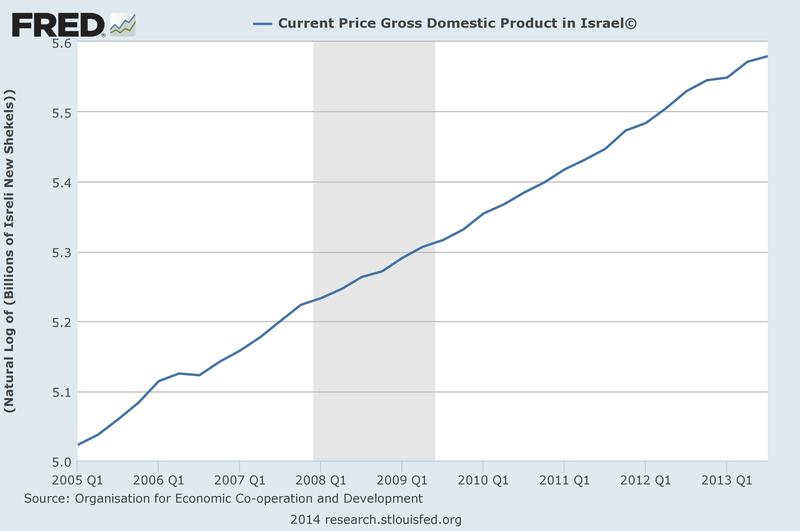 Israel never had a Great Recession. While Stan Fischer in recent years has voiced some scepticism about nominal GDP targeting and instead praised flexible inflation targeting, looking at the data actually shows that the Bank of Israel under his leadership from 2005 to 2013 effectively had a NGDP target. And it is also clear that Fischer quite openly pointed out – particularly in 2009 – that he would not mind temporarily overshooting on the BoI’s official inflation target if the increased inflation was driven by a negative supply shock (depreciation of the Israeli shekel). I believe that Fischer’s de facto NGDP targeting rule is exactly what has ensured a very high level of nominal stability in the Israeli economy over the past decade. This is a remarkable result given the very sizeable negative shock in 2008-9 and the ever present political and geopolitical shocks to the Israel economy and markets. Another very important element in my view is that the BoI under Fischer’s leadership has been tremendously forward-looking compared to other central banks in the world. Hence, it is very clear that the BoI has been focused on targeting the forecast rather than targeting present inflation (in the way for example the ECB is doing). Just read nearly any statement from the Bank of Israel. There will nearly always be an reference not only to inflation expectations, but to market inflation expectations. In that sense the BoI is doing exactly what Market Monetarists have been arguing central banks should – use the market to ‘predict’ the outlook for nominal variables whether inflation or nominal GDP. Furthermore, as market participants realise that the BoI is effectively targeting the (market) forecast the market will do a lot of the implementation of monetary policy. Hence, if market expectations of inflation is too high (low) compared to the BoI’s official inflation target then the market will expect the BoI to tighten (ease) monetary policy. That causes investors to buy (sell) shekel on the expectation of future appreciation (depreciation) as the BoI is expected to move toward monetary tightening (easing). This is of course what I have called the Chuck Norris effect of monetary policy. Under a credible monetary policy regime the markets will more or less “automatically” implement monetary policy to ensure that the monetary policy target is hit – all the central bank has to do is to clearly define its target and to follow the lead from the market. Can other central bankers do the same as Fischer? The economic development in Israel over the past decade is surely remarkable. Few – if any – other countries have achieved anything close to what Stanley Fischer ensured in Israel. The question of course is whether other countries can do the same thing. 1) There is no liquidity trap if you just use other instruments to ease monetary policy than the interest rate (in fact central banks should completely stop communicating about the monetary policy in terms of interest rates). 2) Target the forecast. Central banks should not be backward-looking. Instead central banks should follow the example of Fisher’s BoI and focus on the expected future inflation or the level of NGDP rather than looking at present or paste inflation/NGDP level. 3) Let the markets do most of the lifting. By clearly targeting the forecast the market can effectively do most of the actual implementation of monetary policy – and the central bank should encourage this. 4) Be clear on the target. To allow the markets to implement monetary policy the central bank needs to be completely clear about what the central bank actually wants to achieve. And this is probably where I think Fischer did worst during his years at the BoI. It is clear that he de facto was targeting NGDP rather than inflation, but he has never publically acknowledged this. Luckily Stan Fischer is not retired. Instead he has moved on to become vice-Chairman at the Federal Reserve. If we are lucky he will help Fed boss Janet Yellen do the the right thing on monetary policy and if the US can achieve the same kind of nominal stability as Israel did during Fischer’s term as BoI governor then the outlook for the global economy is quite rosy. Neat! What happened to RGDP? Did Israel have much of a financial crisis? There certainly was a slowdown in RGDP in 2008. This in my view is the effect of the negative supply shock coming from the increase in the ‘cost of capital’ as the global financial crisis hit. However, we never had negative year-on-year growth in 2008 in Israel and RGDP growth swiftly recovered in 2009. All through this NGDP growth remain more or less stable around 6-7%. There was no major financial crisis in Israel. This I believe clearly is a result of the fact that nominal spending was kept “on track”. Great post and bit of info! Thanks! All transactions have two sides. So buying and selling is a wrong headed way to consider trades concerning the shekel. Do you mean that nominal exchange rate expectations change? Or are you referring to a security, such as a government note, that is relatively riskless and denominated in shekels?? Could you please clarify? I might be unclear on your meaning – but I do know that characterizing it as buying or selling is not informative or enlightening.